This photograph of St Paul's Cathedral in Calcutta was taken by Oscar Mallitte in 1865 to form part of an album entitled 'Photographs of India and Overland Route'. It shows a view of the cathedral looking across the Birjee Tank (water supply) on the south-east corner of the Maidan. The cathedral was designed in the Indo-Gothic style by William F Forbes. Forbes, a military engineer who was later promoted to Major General, was also responsible for the design of the old Calcutta Mint where he held the post of Mint Master for a time. 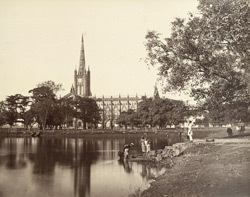 Construction of the cathedral began in 1839, when the foundation stone was laid by Daniel Wilson, Bishop of Calcutta, and completed in 1847. The tall central spire and square tower beneath were inspired by a similar feature at the twelfth century cathedral in Canterbury, England. The upper portion of the tower, which originally reached a height of sixty-one metres, was destroyed in an earthquake in 1934.